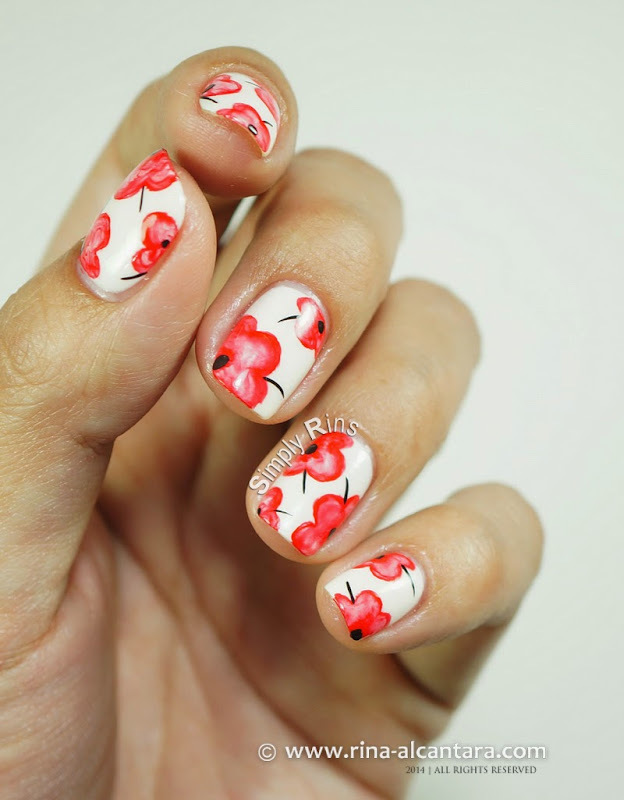 This floral nail art has been in my wishlist for a long time and I'm glad that I finally got around to doing it. I have seen several nail art enthusiasts create this design bringing in their own personal styles to it and I would like to be part of that roster. I find this such a dainty floral design. I wanted some depth on my poppies but I am not particularly good at shading so I thought of using the watercolor technique to achieve a similar effect. It is my first time to do something like this and it was surprisingly quite easy to do. I chose Dazzle Dry At First Blush in 3 coats as background. White would be an obvious preference, but I wanted a subdued base color. I think it made the nail design look more dainty and I love it. This freehand nail art was painted using a detail nail art brush and acrylic paints. I've seen a lot of watercolor inspired nail art and decided to do it a little different for my poppies. I slightly watered down my acrylic paint and started drawing the flowers in a circular motion until the paint is almost dry. The circular brush strokes will result to visible streaks and will spread the color unevenly, creating depth. I was also careful to push the paint on the edges so that it would create an outline for the poppies. From the close up photo, you'll be able to see the brush strokes. The best thing is that I didn't have to worry about being so precised as I was normally used to. And it is very manageable to paint even with my non-dominant hand. So if you're looking for a flower inspired nail art that is easy to do, I would definitely recommend this technique. 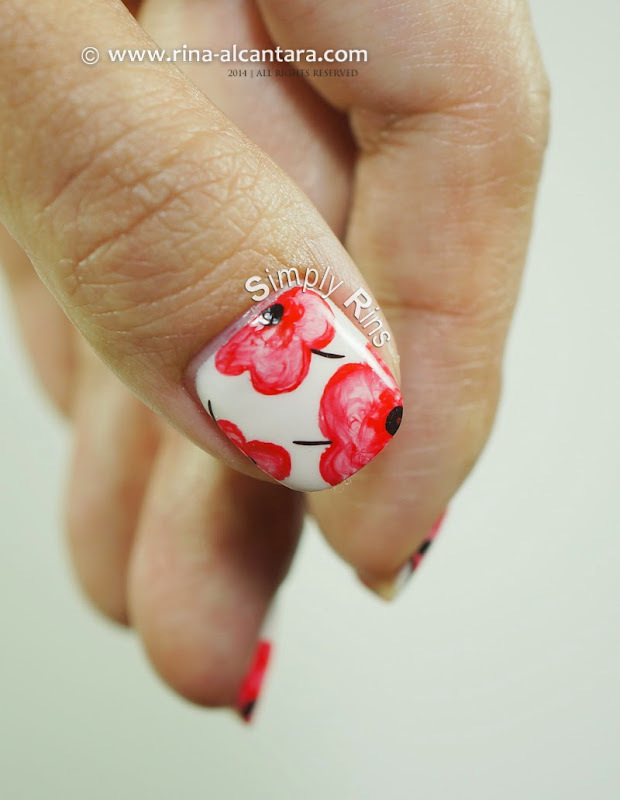 To finish the look, I added short black stems and dabbed some black paint to determine the center for each poppy. I would certainly explore this technique more in furture nail art designs. Have you tried the watercolor technique or something like this? 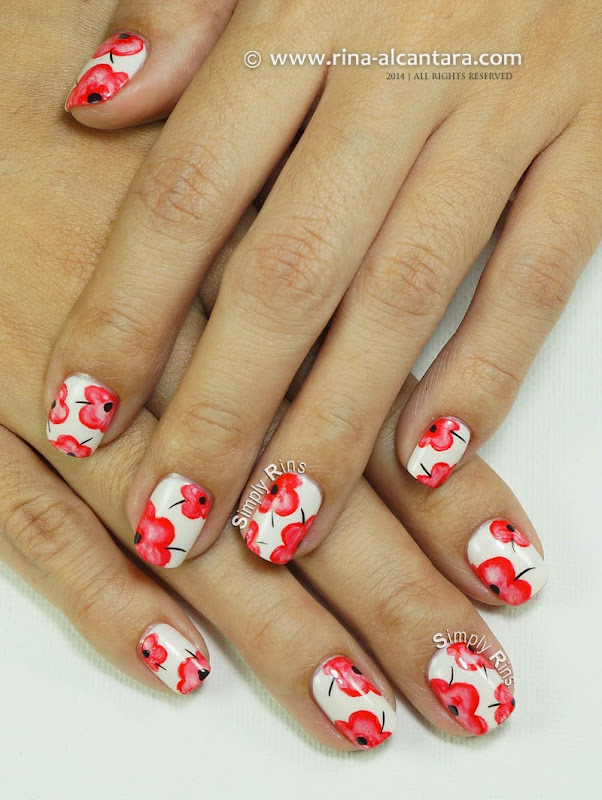 There you have it, my "Pretty Poppies" nail art. I'm bias to the color red, but I really love the way how this turned out. How about you, what do you think? It's nice to know people appreciate my work. These are amazing, Rins. Beautiful work. I don't know if I would be able to do it, but I'm certainly going to give it a try. :) Thanks for sharing the details with us so that we can give it a go.